No, not a post about England’s rise to be the number one Test Cricket team in the world, that is to come. Instead this very brief article refers to a piece on the BBC that, in turn, cites a paper in Geology entitled A 7000 yr perspective on volcanic ash clouds affecting northern Europe (you will need to have a subscription, or belong to an institution that does to read the full text but the abstract is freely available). The BBC’s own take on this is summed up in the title of their bulletin, Another giant UK ash cloud ‘unlikely’ in our lifetimes. My fervent hope is that this is lazy, or ill-informed, journalism rather than a true representation of what is in the peer-reviewed journal (perhaps all the main BBC journalists are on holiday and the interns are writing the copy). To state the obvious, in general, the fact that something happens every 56 years does not guarantee that the events are always 56 years apart. For a more cogent review of predicting volcanic erruptions, see my earlier post, Patterns patterns everywhere. I suppose that words didn’t entirely fail me, but the length of the above article is effectively the same thing for me! Hi Peter, BBC report sounds like a case of too much reliance on bell curve probability and not enough understand of fat tails and/or complexity. Thanks for sharing! Article sound much more like junior staff left to copy random words from paper they didn’t understand and no editors around to check their copy – or at least I hope for for the sake of journalism in this country! There have been some press releases about this paper which do not give the full story and provide a biased view of our results. 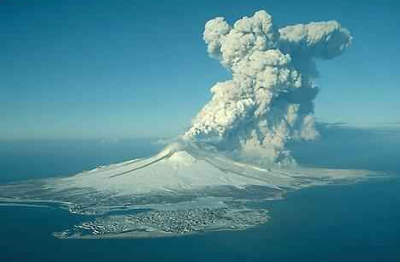 We calculated that in the past 1000 yr – when the best records are available – volcanic ash clouds reached northern Europe with a mean return interval of 56 ± 9 yr. However, the return interval has varied from a minimum of 6 years and a maximum of 115 years between events over the last 1,000 years. This is different to saying that ‘we have to wait another 50 years before the next ash cloud!’. Statistical modelling using the ash records for the last millennium indicates that for any 10 yr period there is a 16% probability of a tephra fallout event in northern Europe. Although these estimates have important implications for the aviation industry, insurance companies and the travelling public, they must be considered as conservative estimates due to the nature of capture and preservation of volcanic ash in sedimentary records. My quibble was with the ultra-simplistic way that your findings were reported on the BBC. In my experience statistical matters are not often reported accurately and often give people entirely the wrong impression. This BBC article was certainly a surprise for me when I returned from holiday! Many thanks for your blog – It will help set the record straight! Have the PDF now – will take a read this evening.